Home › Blog › What is Biblical bitterness? Most of the time, it’s agony and grief. What is Biblical bitterness? Most of the time, it’s agony and grief. Notice that Experiential Bitterness (#1) and Grieving Bitterness (#2) are definitely causally related. Destructive Bitterness (#3), as will be shown in a separate post, is not necessarily a result of #1 (although it can be), but it will naturally become a source of #1. Job 9:18 he will not let me get my breath, but fills me with bitterness. The traumatic loss of his home, family members, and health caused grief to Job. Pro 5:3-4 For the lips of a forbidden woman drip honey, and her speech is smoother than oil, but in the end she is bitter as wormwood, sharp as a two-edged sword. Solomon warned his son against the ultimate grief of going down the road of fornication and adultery. Pro 17:25 A foolish son is a grief to his father and bitterness to her who bore him. When parents know that their foolish son is headed for destruction, this is a cause of great agony and grief. Jer 2:19 Your evil will chastise you, and your apostasy will reprove you. Know and see that it is evil and bitter for you to forsake the LORD your God; the fear of me is not in you, declares the Lord GOD of hosts. The choice to forsake the Lord will be a choice of destruction, causing agony and grief. Jer 4:18 Your ways and your deeds have brought this upon you. This is your doom, and it is bitter; it has reached your very heart. The people’s destructive choices have brought them destruction. This is a source of agony and grief to them. Lam 1:4 The roads to Zion mourn, for none come to the festival; all her gates are desolate; her priests groan; her virgins have been afflicted, and she herself suffers bitterly. The people of Jeremiah’s time experienced the grief of destruction of their homeland because of their sin against the Lord. Zep 1:14 The great day of the LORD is near, near and hastening fast; the sound of the day of the LORD is bitter; the mighty man cries aloud there. Judgment on those who have turned away from God will cause agony and grief. Destructive choices, traumatic losses, and the wrongdoing of others all cause grief. They are all bitter experiences. How did God make us. How did God make us? He made us so that when a tragic or traumatizing thing happens, we feel it. If for some reason people can’t feel it or refuse to feel it, they can become physically ill. They can become divided in soul. The refusal to feel the grief can cause even the “good” feelings such as joy and contentment to be shut down. And tragically, the ability to feel empathy for another person can be lost. In the Bible, people felt their bitterness. Who felt the grief and what were they responding to? 1Sa 22:2 And everyone who was in distress, and everyone who was in debt, and everyone who was bitter in soul, gathered to [David]. People felt grief because of their terrible circumstances. Joining with David gave them a sense of hope in their dark situation. 1Sa 30:6 And David was greatly distressed, for the people spoke of stoning him, because all the people were bitter in soul, each for his sons and daughters. But David strengthened himself in the LORD his God. People’s family members had been taken captive by the Amalekites, so they felt great grief. Job 10:1 I loathe my life; I will give free utterance to my complaint; I will speak in the bitterness of my soul. Job felt the overwhelming grief of losing his family members, material goods, and health. Isa 38:15 I walk slowly all my years because of the bitterness of my soul. Isaiah felt grief in his soul because of the destructive choices and consequent destruction of his people. In recent times a large segment of the Christian church has adopted the Stoic attitude that our feelings aren’t important, that we should squelch our feelings, that feelings should simply be subjected to reason. But no matter what we may think about how “Christian” it is to refuse to express any emotion that others deem negative, the fact of the matter is that the effects of bitter experiences will still come out from within us in one way or another, because that’s the way God made us. For these people of the Bible, their feelings of grief and bitterness came out in an agonizing expression of their grief and bitterness. Gen 27:34 As soon as Esau heard the words of his father, he cried out with an exceedingly great and bitter cry and said to his father, “Bless me, even me also, O my father!” Esau expressed the grief he felt at the betrayal by his brother and the loss of the blessing. 1Sa 1:10 She was deeply distressed and prayed to the LORD and wept bitterly. Hannah expressed the grief she felt at her inability to have a child. Est 4:1 When Mordecai learned all that had been done, Mordecai tore his clothes and put on sackcloth and ashes, and went out into the midst of the city, and he cried out with a loud and bitter cry. Mordecai lamented because of the declaration of the king that all Jews would be destroyed. Isa 22:4 Therefore I said: “Look away from me; let me weep bitter tears; do not labor to comfort me concerning the destruction of the daughter of my people.” Isaiah mourned the destruction of his people. Jer 6:26 O daughter of my people, put on sackcloth, and roll in ashes; make mourning as for an only son, most bitter lamentation, for suddenly the destroyer will come upon us. Jeremiah told the people to lament because destruction was coming. Jer 31:15 Thus says the LORD: “A voice is heard in Ramah, lamentation and bitter weeping. Rachel is weeping for her children; she refuses to be comforted for her children, because they are no more.” The people would cry out with a great lament because of their destruction and that of their children. Luk 22:62 And [after denying Jesus, Peter] went out and wept bitterly. Peter mourned and lamented, expressing poignant grief over what he had done to his Lord. Far more than any other usage of the word, the word bitterness in the Bible means causing agony and grief (definition #1) or experiencing/expressing agony and grief (definition #2). The experience of bitterness (#1) causes grieving bitterness (#2), which is the primary kind of bitterness in the Bible. 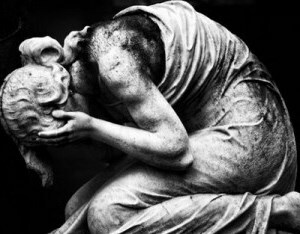 This is a bitterness that is expressed in great sorrow and mourning, something completely appropriate for God’s people to do. The fact that so much of our Christian culture tells us that we should not have these feelings might lead us to believe—I think accurately—that our culture doesn’t really understand grief. But these Scriptures should make it clear that grieving bitterness is not a sin. Also, because of the utter absence of any connection between grieving bitterness and lack of forgiveness, it can be assumed that these two concepts are unrelated. Even after a person has forgiven an offender, there can still be great agony and grief over something terrible that has happened. There can still be Biblical bitterness. We can expect the Lord to bring us out of our bitter sorrow and grief, to turn our mourning into dancing, to turn our ashes into beauty. But this does not preclude the fact that in this life there is still mourning. There is still grief. There is still agony. In the midst of the mourning, though, our Lord has promised that He mourns with us. If the season of life we’re in doesn’t include mourning, but we know of others who are walking that dark valley, He’s covered that one too. He has told us that we are to weep with those who weep. This is true empathy, being willing to feel the agony and grief of others. Being willing, in the Biblical use of the word, to be with them in their bitterness. The fourth and final post in this series on bitterness will cover Definition #3, what I’ve called “destructive bitterness,” examining the references to it in the Bible and further explaining how it connects with the other meanings of the term. 2 Pings/Trackbacks for "What is Biblical bitterness? Most of the time, it’s agony and grief."